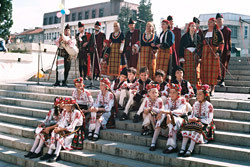 The European Heritage Days 2004 were held in Bulgaria in the spirit of the 50th Anniversary of the European cultural convention and the permanent motto of the Days – Еurope, a common heritage. The selection of national theme Cultural tourism corresponds to the world trend – the heritage to become known and used through cultural tourism, as a powerful resource for stable social development. This trend is of present interest especially for Bulgaria, as 19 projects under the aegis of the European Union’s PHARE Program for "Development of cultural tourism in Bulgaria" are implemented during this year. Besides that this topic is in unison and supports the initiative of the Ministry of Culture for development of Strategy for cultural tourism. 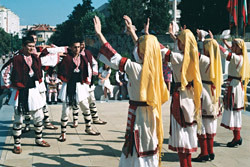 Some international aspects of this theme are also considered important – the development of cultural tourism in the Balkan region would use the extremely rich potential of its heritage, exhibiting its specific features: common roots, strong inter-relations and exceptional cultural and historical assets. 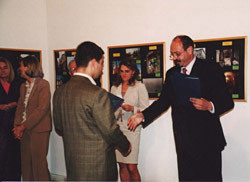 Parallel to that, cultural tourism could contribute to a considerable extent to the opening, mutual acquaintance and cultural integration among the countries from the Balkan region, in the spirit of the Regional project Cultural passages of South-Eastern Europe, starting in 2005 under the patronage of the President of the Republic of Bulgaria Mr. Georgi Parvanov and the General Director of UNESCO Mr. Koishiro Mazuura. 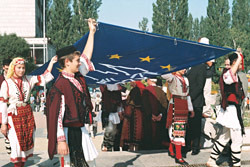 The main objective of the European Heritage Days 2004 was to exhibit and promote the resources for development of cultural and Eco-tourism: the local ones – on the territory of the participating municipalities, the national ones – in the country as a whole, and the regional ones – on the territory of South-Eastern Europe. The implementation of this aim could be considered as continuation of the already achieved during the EHD 2003, whose main topic "Cultural landscapes" provoked great public interest to this exceptional combination between natural and cultural assets, so typical for our country. Along with that, another important aim of the EHD 2004 was the recognition of the role cultural tourism as means for mutual acquaintance of the various communities, exhibit of the regional identity and variety, as well as for the integration of the common European culture. 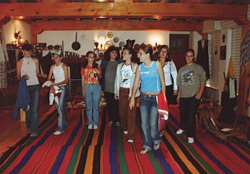 During the Days particular stress was laid on the inter-relation between "Culture" and "Tourism", the Bulgarian experience in the field of cultural tourism was presented, the PHAR projects were given publicity. The constant aim of the EHD – raising of the interest, sensitivity and awareness of the public – especially of children and youth – to the cultural heritage, was constantly in the focus of attention. The organisers of the EHD 2004 in Bulgaria were: the Ministry of Culture (under the aegis of which the Days were held), the Ministry of Economics, the Ministry of Regional Development and Planning, the Ministry of Education and Science, the Ministry of Environment and Waters, the Ministry of Youth and Sport, the National Institute for Monuments of Culture, the Assenovgrad municipality, the Bulgarian National Committee of ICOMOS (National co-ordinator). With the financial assistance of the Ministry of Regional Development and Planning, the Bulgarian National Committee of ICOMOS published a brochure, dedicated to the European Heritage Days 2004, presenting also the 19 projects, developed by the PHAR Program and the Program of the European Union "Development of cultural tourism in Bulgaria". 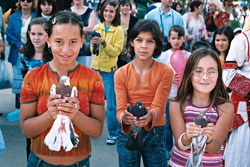 In the European Heritage Days 2004 participated more than 30 municipalities, over 100 museums and a number of voluntary NGO, schools and higher schools. 1. 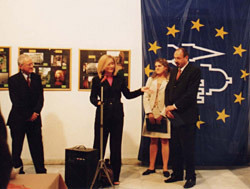 Official opening of the EHD 2004 on national scale. 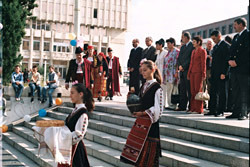 The ceremony was held on 25 September on the main square of Assenovgrad, with great public interest and with the participation of the Mayor of the town, the Minister of Regional Development and Planning, the Deputy Minister of Culture, representative of the Delegation of the European Union in Bulgaria, the Chairman of the Bulgarian National Committee of ICOMOS and other official guests. The flag of the EHD was officially raised and a concert was held with the participation of local children musical and dancing groups. 2. 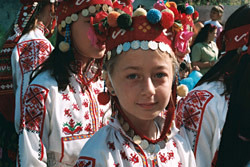 National Workshop dedicated to "Cultural tourism", Assenovgrad, 24-25 September. In the Workshop participated experts (from various scientific and educational institutes and professional organisations), administrators and specialists (from the Ministry of Culture, the Ministry of Economics, the Ministry of Regional Development and Planning), as well as managers (of the 19 projects, developed by the PHAR Program). The participants in the Workshop discussed the unsolved problems and conditions for the development of cultural tourism and adopted decisions for future actions. 3. International exhibition "IX International photo-experiment for monuments of culture" (the awarded works of the international youth photo-competition 2004 dedicated to "Monuments of culture", held annually under the aegis of the Council of Europe). The Exhibition was held in the French cultural institute in Sofia, with the kind assistance of the French cultural attache. All national events were given publicity by the press and national televisions, the latter broadcasting reporting and interviews with the participants. 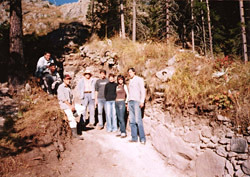 More than 30 municipalities in the country participated in the EHD 2004 with various rich programs. Special emphasis should be laid on the participation of the following municipalities: Assenovgrad, Blagoevgrad, Bourgas, Choumen, Dobrich, Dryanovo, Gabrovo, Georgi Damyanovo, Montana, Nedelino, Panagiurichte, Pazardjik, Pernik, Razlog, Samokov, Sapareva bania, Svishtov, Silistra, Smolyan, Sofia, Stara Zagora, Teteven, Troyan, Varna, Varshetz, Vidin. The latter were joined by the municipalities, on the territory of which are developed the 19 projects, sponsored by the PHAR Program "Development of cultural tourism in Bulgaria" – they participated in the Days with events promoting these projects. 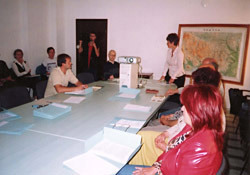 Engagement of the local mass media – press and electronic – in the organisation of the Days with various information, debate and educational materials. Work on the European project "From one street – to another"
Engagement of the youth parliaments with various initiatives as: development of web sites dedicated to the "Cultural heritage", organisation of youth forums on the topic of the EHD "Cultural tourism"; organised tours to local cultural, historical and natural landmarks. 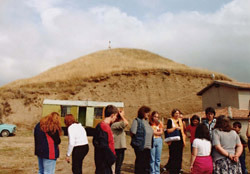 Various opportunities for regional co-operation in the region of South-Eastern Europe in the filed of cultural tourism were pointed out, as well as possibilities for the exhibit and use of the common cultural heritage – including through co-ordination among the countries from the region concerning the organisation of the EHD.